The Bärenjäger competition was held at super secret Woodson & Ford (yes we were allowed back! )and since I was a contestant I was invited to the finals. Julie Reiner (co-owner of Flatiron Lounge, Clover Club, & Pegu Club), Allen Katz (of Southern Wine & Spirits), Aisha Sharpe (of Contemporary Cocktails), Jack Robertiello (Booze writer)and THE Gary Regan (writer and bitters aficionado) were on tap to judge the competition. Loungerati was on hand to sample the cocktails which included the Clover Club's Brad Farran's El Oso Agridulce (Pueblo Viejo Reposado tequila, Bärenjäger Honey Liquer, Cynar, lemon juice, and creme de cacao) with a crowd of industry bloggers, bartenders, brand ambassadors, and drinkers. Bärenjäger, a German honey liqueur, is a neutral grain spirit like vodka that is made with honey from the Yucatan peninsula in Mexico. The recipe is four hundred years old but the flavors are hardly ancient. 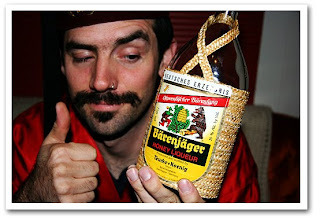 Sweet yet potent, Bärenjäger is an interesting and tasty marriage to say the least. An all-expense paid trip for two to Oktoberfest 2009 in Munchen, Deutscheland. The recipes were submitted through Bärenjäger’s website. I submitted a Honey Bees Knees (Beefeater Gin, Bärenjäger Honey Liquer, Lemon Juice, Fresh Ginger)and though I didn't make it, I enjoyed the event! Combine ingredients in glass over ice. Stir and strain into chilled coupe. Dry shake all ingredients except the lager, add ice and shake again. Double strain into chilled Highball glass, top with the Toasted lager beer and garnish with a slice of fig. I now have a parting gift - a bottle of Bärenjäger which I will enjoy! Congrats to the winners and a big thank you to the participants!! If you throw an empty bottle of Barenjager, in Maine, while motorcycling camping, with 133 guys, into a 15 foot bonfire...the bottle will shatter. J Walter Hawkes wins second Emmy!